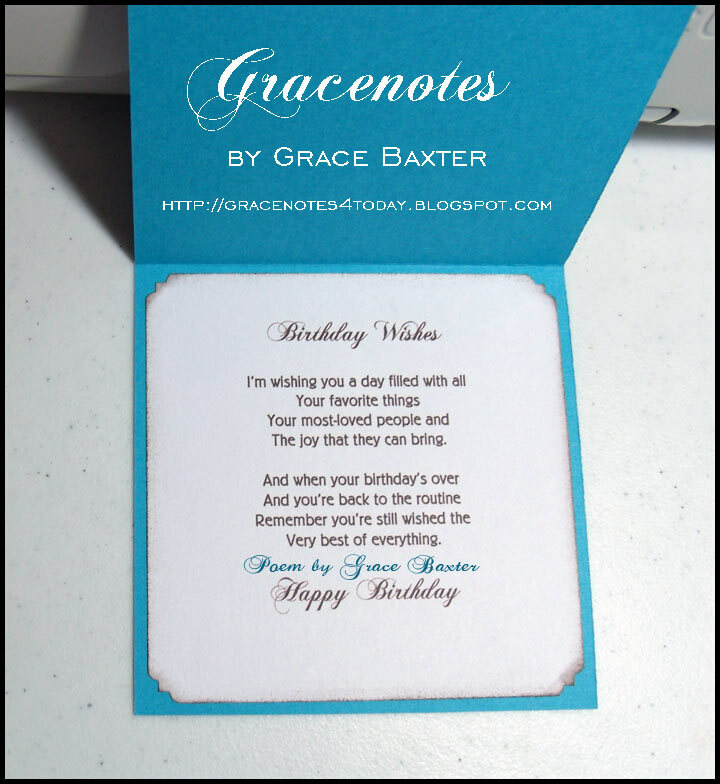 This card was designed for a birthday but could also work for Father's Day or any other masculine occasion. 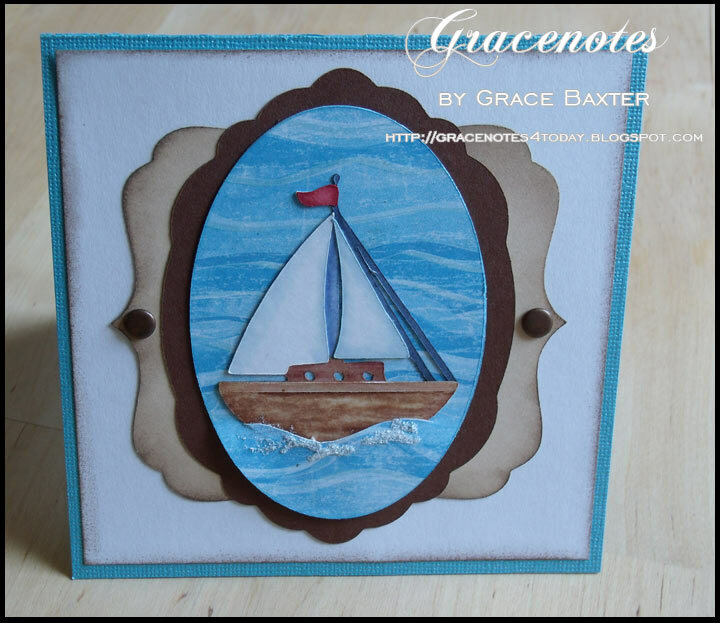 Using Life Is A Beach, I cut the sailboat at size 2-1/2 from white cardstock. That's right... all white. I then coloured it with alcohol markers, blending browns for the sailboat's hull. I wanted the sails to be white but still have dimension. So I used pale blues and blended them out to nothing in the center of the sails. Finished card size: 5"x5" cut from aqua pearlized cardstock. White frame: 4-3/4" X 4-3/4"
Brown oval frame: Forever Young cartridge (perfume oval), 3.25W x 3.3H with Emblem feature on. Water oval: First cut a plain white one at 2.6W x 3.75H as backing. Then cut one from water paper. Cream-coloured frame: Cut from Storybook at size 4x4. This was sized on the Gypsy. I composed the poem and printed it in Word onto white cardstock. All edges of the white and cream frames are inked in brown. The paper used for the waves already looked wavey, so following the natural wave lines I cut a slit in the paper and slipped the hull of the sailboat into the slit. This made the boat actually sit IN the water as opposed to sitting in front of the water background. 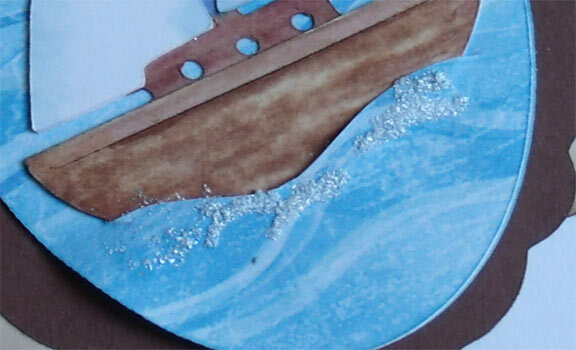 Then I added some stickle glue and glitter to create the splashes of waves. Bronze brads finish off the front. Tip: I added a piece of dimensional tape behind the wave paper, underneath the ship's hull. 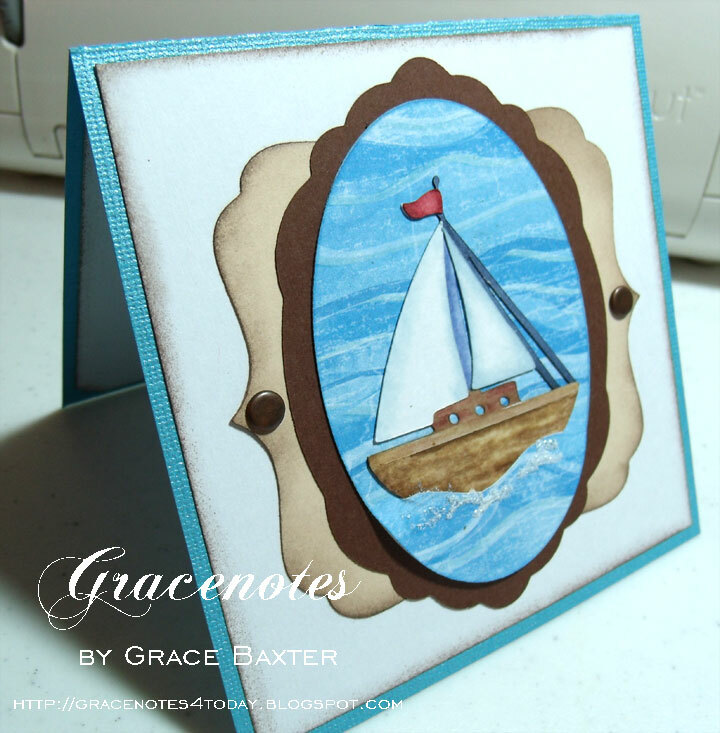 Since the ship is fairly thick the paper wouldn't lay flat. The piece of foam tape gave it just the right amount of lift. Oh my...this is just stunning! What amazing talent you have! Just love the look of this so much!